(16/P90) TRENTON – A long-awaited U.S. Army Corps of Engineers beach and dune construction project that will protect homes, businesses and infrastructure in coastal northern Ocean County – one of the areas hit hardest by Superstorm Sandy – has gone out to bid, Department of Environmental Protection Commissioner Bob Martin announced during a news conference today. The project will cover some 14 miles of coastline along the Barnegat Peninsula and will protect the communities of Bay Head, Berkeley, Brick, Lavallette, Mantoloking, Point Pleasant Beach, Seaside Heights, Seaside Park and Toms River. This is the last major stretch of beaches to go out to bid for construction to Army Corps standards, a major goal of the Christie Administration in the aftermath of Sandy. Work on the project, expected to cost about $150 million, is expected to begin by the spring. Commissioner Martin was joined at the news conference by Army Corps of Engineers’ Philadelphia District Commander Lt. Colonel Michael Bliss, as well as mayors and other local officials. In October 2012, the project area was hit especially hard by Sandy, with the ocean breaching the peninsula in Mantoloking and record storm surge causing significant damage to Brick, Lavallette. 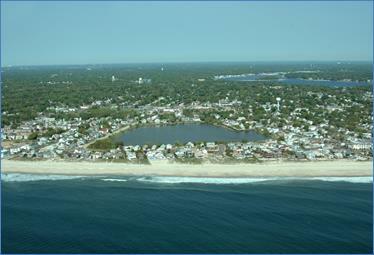 Mantoloking, Seaside Heights, Seaside Park and the Ortley Beach section of Toms River. Homes, businesses, piers, boardwalks and infrastructure – including State Route 35 – were destroyed or severely damaged. Engineered beaches are a key component of the Christie Administration’s overall plan to make New Jersey more resilient to major storms. Properly engineered beaches and dunes absorb the impact of storm surge, preventing damage to structures and infrastructure. A key part of the project is the construction of dunes and beaches along a four-mile stretch of sea wall in Mantoloking and Brick that the DEP teamed up with the New Jersey Department of Transportation and the Federal Highway Administration to build as added protection for Route 35. This is the main artery and coastal evacuation route through a particularly vulnerable stretch of the peninsula that was severely damaged during Sandy. This highway, since reconstructed to modern design standards, was the scene of a major breach at the Mantoloking Bridge during Sandy. The protective wall is comprised of steel sheet pilings driven deep into the sand that will serve as emergency backup protection, with the beach and dune system providing primary protection to the roadway. After the award of the bid, expected this fall, work will begin with beach and dune construction in southern Mantoloking, as well as all of Lavallette, Toms River, Seaside Heights and Seaside Park. Work in Bay Head, Berkeley, northern Mantoloking and Point Pleasant Beach will begin after necessary easements have been obtained. A total of 545 easements are needed for the project. An easement is a legal right of access to private or municipally owned property the Army Corps and DEP need to perform construction. Nearly 350 easements – or 64 percent – have been provided voluntarily. The state has obtained additional easements through condemnation proceedings under the Eminent Domain Act, and currently has 149 condemnation proceedings in litigation, with 83 involving Bay Head, 53 involving Point Pleasant Beach, nine involving Berkeley and four involving Mantoloking. Over the course of the project, some 11 million cubic yards of sand will be pumped from offshore to build dunes and beaches. For most of the project area, dunes will be built 22 feet above sea level. Beaches will be constructed from 100 feet to 300 feet wide and 8.5 feet above sea level. The project area will receive periodic replenishment projects over the course of 50 years to replace sand lost through normal erosion. The federal government will be paying for 65 percent of the project using money approved under the 2013 Disaster Relief Appropriations Act, which funds projects that Congress had previously authorized but had not been completed by the time Sandy hit in October 2012. New Jersey will pay for 35 percent of the project from the state’s Shore Protection Fund. In other parts of the state, a $57.6 million beach and dune project encompassing beaches at the southern end of Ocean City, the Strathmere section of Upper Township and Sea Isle City in Cape May County is complete. And a $38.2 million project to construct beaches and infrastructure in Loch Arbour, Allenhurst and Deal in Monmouth County also is finished. A second Monmouth County beach fill project from Elberon to Deal is ongoing. A $140 million beach and dune construction project covering 12.7 miles of beach on Long Beach Island is expected to be completed before the end of the year. Work is also expected to begin this winter on a beach and dune project for Atlantic County’s Absecon Island, which went out to bid earlier this month. The project involves initial construction of engineered beaches for Longport and Margate and replenishment of beaches in Atlantic City and Ventnor. In addition, periodic replenishment for Cape May Point and Cape May City is expected to take place this winter.